Incase what you wanna do doesn't workout even after successfully making Repair or Changes of your IMEI Number, it's important that you Back up your IMEI even before carrying out any action on the device from the beginning. Or better Use the Backup option in MobileUncle tools. After everything, you still can put back your previous IMEI you backed up on your SD card. 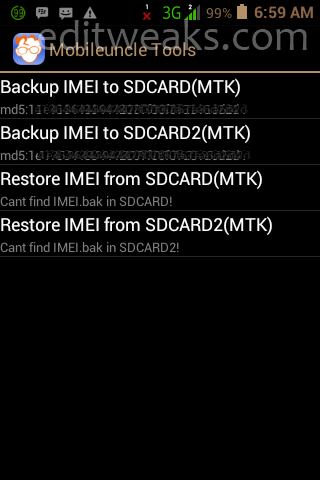 >> select - Restore IMEI from SDCARD(MTK) or SDCARD2(MTK), depending on which one you used to back up your IMEI. Found this Useful?, click the Share button below.